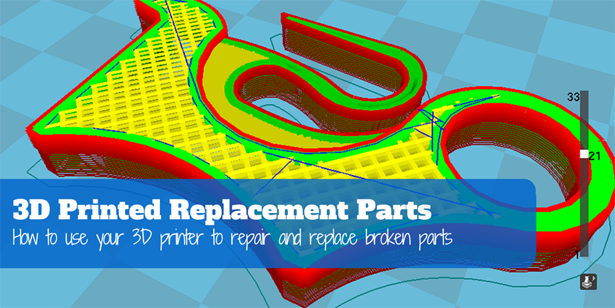 ​Thankfully with 3D printing we finally have the means to produce our own repair and replacement parts. Armed with a standard desktop 3D printer and a few simple tools you can prototype your way to the perfect replacement piece. To illustrate such a 3D printing repair project were are bringing back the author Cliff Smyth. 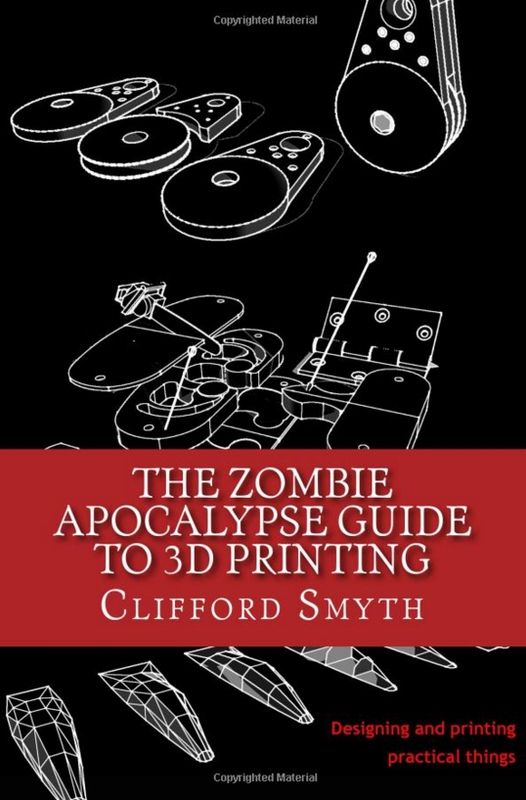 Last week we reviewed Cliff's latest book The Zombie Apocalypse Guide to 3D Printing. In fact, the below article is taken from Chapter 2 - Prototyping and printing replacement parts, from knobs to triggers of that very book. When I first saw it, the chainsaw had been taken to pieces and left for dead some time ago by a friend of mine. I saw it on his boat, and asked him about it. He told me it was now missing a piece and asked me if I wanted it. He said he had tried to find a replacement part, but since the saw was no longer being manufactured or supported by the manufacturer there were none available unless I could find one used. Gazing lovingly at the greasy sack of parts, I of course took the bag into my gentle care and brought it home with me. 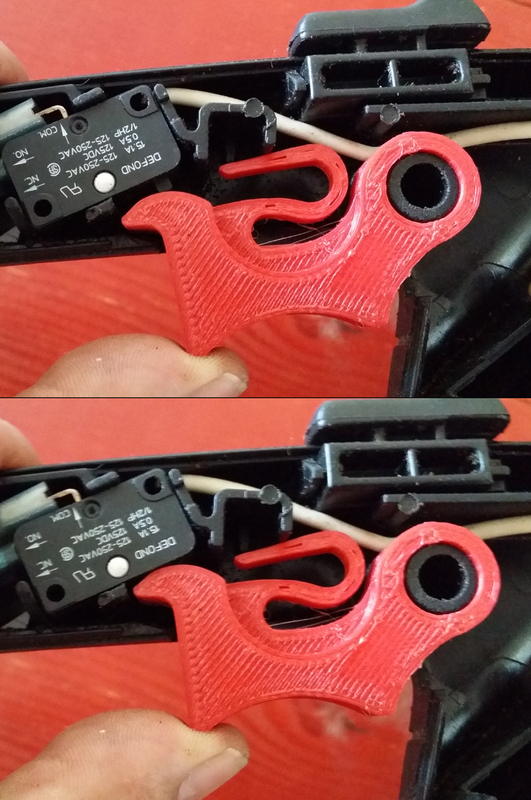 Once home, I looked it over and it seemed complete except for the trigger switch....an easy fix for someone with a 3D printer, I considered, warming to the task. With visions of a mounting an electric chainsaw zombie defense with my soon to be repaired battle saw, I began to sort out how to go about getting started. As often occurs, I was faced with the task of designing a replacement part with no original part to start from. In the case where a broken original is available the process can be easier, but in many cases the form of the missing part can be imagined from the function and location it serves. 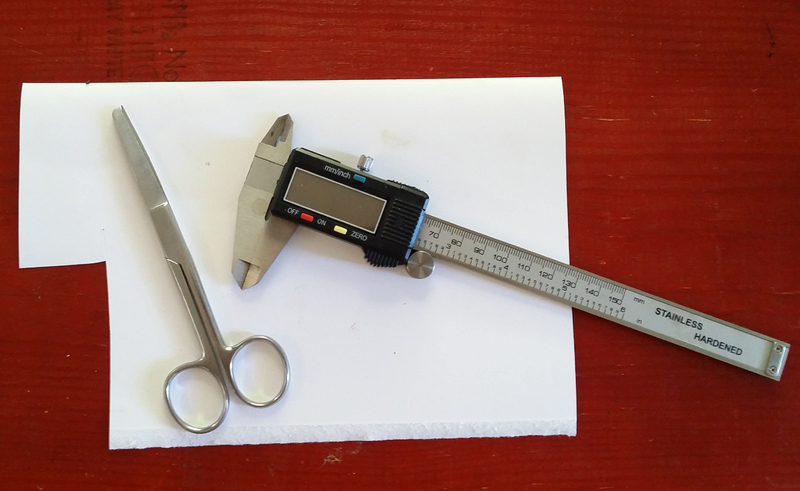 I find that the most important tools for a project like this (besides drafting software and a 3D printer) are a precision measuring device such as a set of calipers, a bit of cardboard, and a good pair of scissors. This will make it trivially easy to make template prototypes to check clearances, sizes, and shapes. 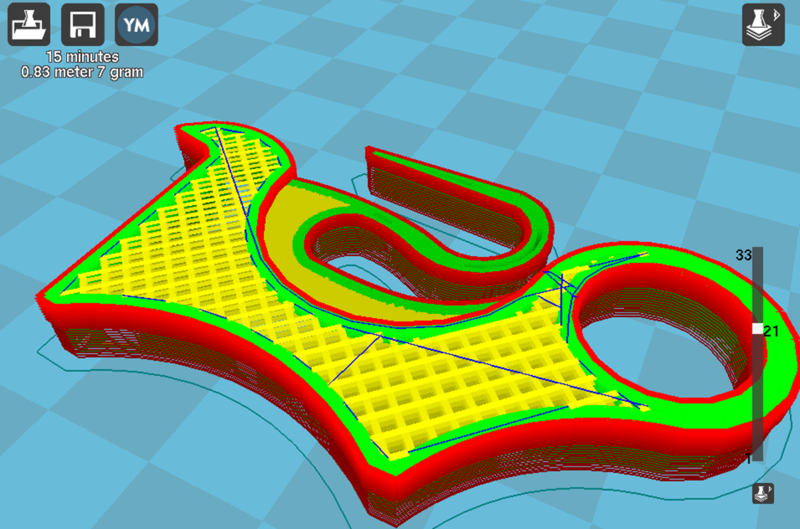 Aside from your 3D printing setup, a few simply tools will make fitting a prototype template quick and easy. First, I installed the switch and wires into the handle so that I could imagine what shape a new part would have to be to activate the switch. I started fiddling around with paper card cutouts until I got something of about the right shape. After fitting and refining the paper mock-up, I checked it through its full range of motion to be sure it could depress and release the little micro switch. I then verified that it would remain captive in the handle in the correct position when released, even if it was being knocked around a bit. 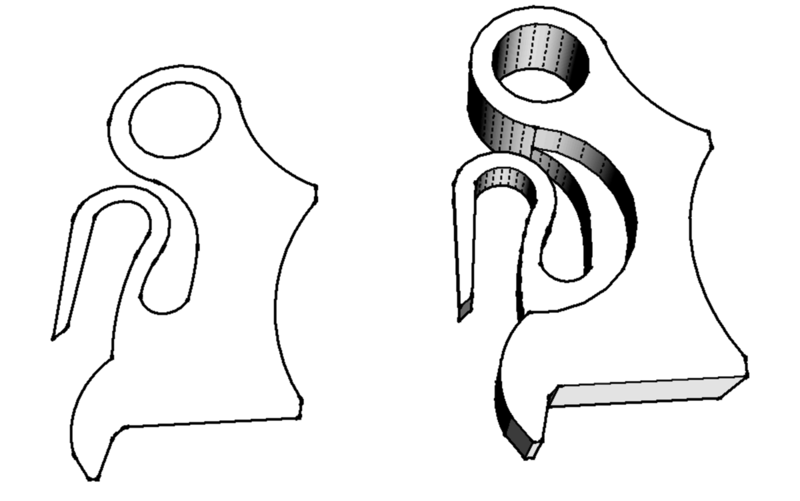 The process of creating a template for the prototype cross section: Preparation, initial fitting, revision, and final checking for fit and functional shape. In cases like this, it is often practical to think in terms of expanded 2-dimensional shapes or prisms. 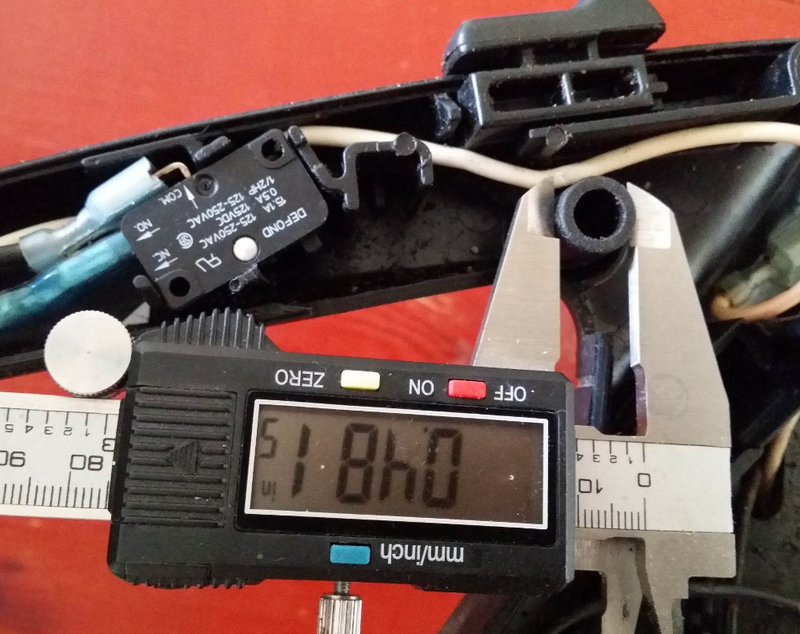 At this point I noted that the micro switch had a fairly weak spring. I felt that it was not strong enough to prevent accidental operation of the saw, and certainly not strong enough to return the trigger to the off position reliably if the operator was wearing gloves. A quick look around my workshop revealed that I had no suitable small springs lying around, so I started thinking about how to integrate a plastic spring into the design. I decided to use ABS for the print material, as I have much more experience with plastic springs in ABS than in other materials. After taking some critical measurements from the saw handle and the paper mock up, I began drawing out the part in Trimble Sketchup - one of my favorite programs for simple jobs like this despite its many, many shortcomings as an engineering CAD program (don’t judge me). I printed a short version, interrupting the print after about 10 layers to test the fit and position of the spring I designed. It fit well and looked like it should work, so I printed another full part. Stopping mid print after ten layers, a partial print is tested for proper fit before printing the final piece for installation. As print speed (I'm impatient) and strength were the only critical parameters, I printed at 0.5mm nozzle width and 0.3mm layer height. I have a 0.4mm nozzle on this machine, so 0.5 is slightly over my actual nozzle width. In general up to 20% over your actual nozzle width will give good results, and better overlap between extrusion lines. By “nozzle overloading” you can gain part strength and printing speed at the expense of a surface finish and dimensional accuracy. It’s important to note that you need to draw your part slightly smaller than the desired dimensions of the finished piece due to overextrusion. Normally, about 0.2mm on each side (not top and bottom) is about right, but when you use a setting larger than your actual nozzle size like I did in this case, this can go up to 0.3 or even 0.5mm for accurate finished part dimensions. Because I was printing a spring, I used 1.5mm wall (perimeter) thickness. Springs tend to work better when they are solid or nearly so, and the best way to fill them in is by increasing the perimeter thickness rather than setting the infill to 100%. This is because the orientation of the extrusion lines will be in line with the spring shape when perimeters are printed, but not (necessarily) when infill is printed. A quick look at the tool path verifies that the return spring will print as a near solid, for maximum resilience and durability. It is often useful to incorporate functional details such as springs into parts like this one. The “trick” to plastic springs is to make the spring as long as possible, so that the deflection is spread over a large area. This way, the stresses from bending are well distributed, and the elasticity of the plastic can return the part to its original shape without permanent deformation. After printing, I tested the spring through its entire range of motion and then some, looking for evidence of stress failure. This can be seen on ABS parts as tiny white lines that form on the surface of the print where most of the stretching is taking place. After seeing none, I intentionally overstressed the spring to see where and when stress fractures would appear. 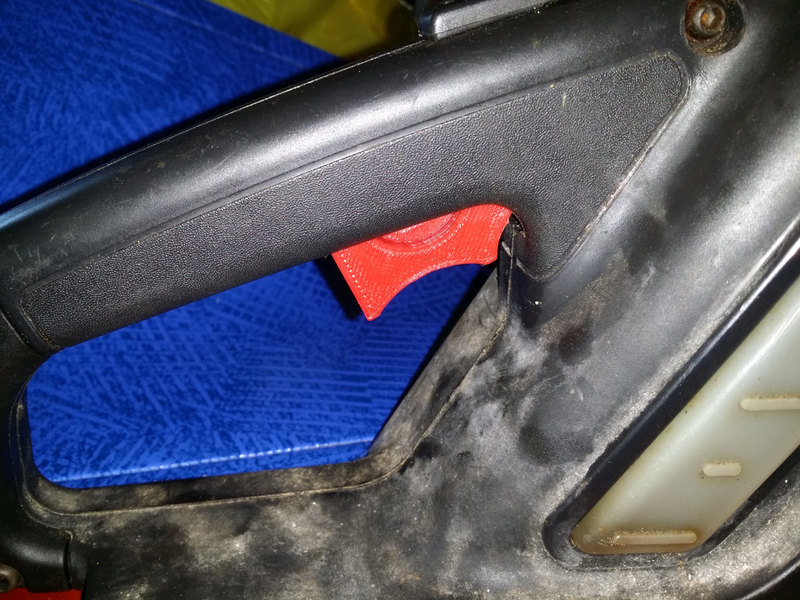 Satisfied that extreme excursions from design conditions were necessary to produce stress fractures in the spring, and that even after over-stressing the spring still functioned as intended, I printed another part for actual installation. The completed part, installed for final checking. I installed the part, tested it through its range of motion, checking for looseness, stickiness, reliable operation, and general ergonomic usability. No problems were found or changes indicated, so I assembled the saw and cut some wood as a test. I have used a similar process to repair many items, and even for complex 3D parts a cardboard or thin plastic cut-out template is often useful as a starting point. Test pieces can be printed to a minimal height and checked, and then the “real” part printed after finalizing the design. Nozzle overloading allows fast turnaround for prototypes (or even finished parts), and enables you to get results much faster than printing at regular settings. Next time you have something that could be fixed if you just had a new piece, try these simple, easy to apply techniques to streamline your prototyping workflow. Editor's note: as mentioned in the intro, this article is an extract from the book The Zombie Apocalypse Guide to 3D Printing. Below is a quick summary of the book, you find our complete review here. The Zombie Apocalypse Guide to 3D Printing is a quick and fun read that belongs on the book shelves of all those 3D printing enthusiasts who are looking to produce repair and replacement parts or manufacture new items. The book contains excellent tips and pointers to help you to improve your design skills as well as your understanding of critical technical details required to turn your 3D printer into a true desktop factory. Who is it for? : The Zombie Apocalypse Guide to 3D Printing, is not a comprehensive introduction to 3D printing, nor does it teach you CAD. This book assumes that you have some working knowledge of 3D design software or at least that you are learning it. 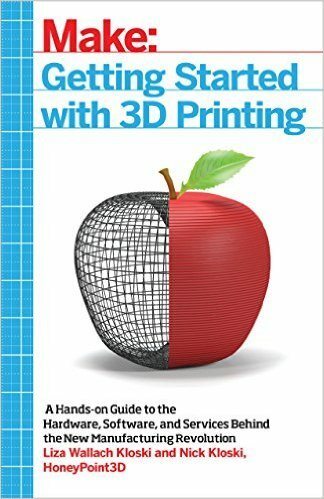 As such this book will benefit intermediate to advanced CAD users or ambitious newcomers who are no longer content to simply print downloaded 3D models. If you enjoyed this piece of content, feel free to share it on Twitter, Facebook or any other of your favorite social media outlets! Great post, very useful to see your design process. I’m sure this will come in handy around the house! 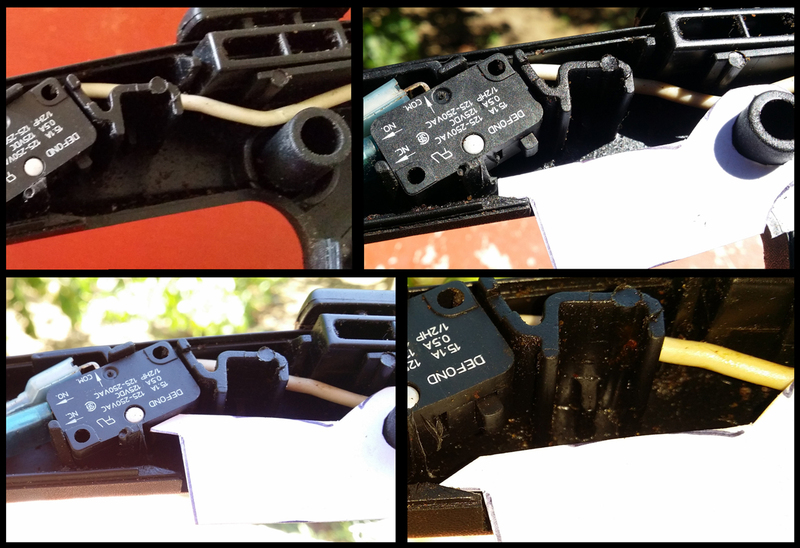 Honestly, when you mentioned how a mis-designed (or failed) switch could cause the chainsaw to be difficult to shut off, it made the hairs on the back of my neck stand up! Even though your part looks well design (the spring, for example, looks solid and really nice), I’m not sure I’d trust my own capabilities for such a critical part! Anyway, nice work. Yes, working on the chainsaw is actually not something I would recommend to beginners. But you can design many (less dangerous) household parts with your 3D printer, instead of having to throw your part, machine or item away. Even if you do not trust your capabilities, just try, fail, learn and try again until it works. 3D printing is not a run-of-the-mill solution and you have to tinker and experiment around a bit, before managing such a repair as Cliff did. And always remember: safety first. 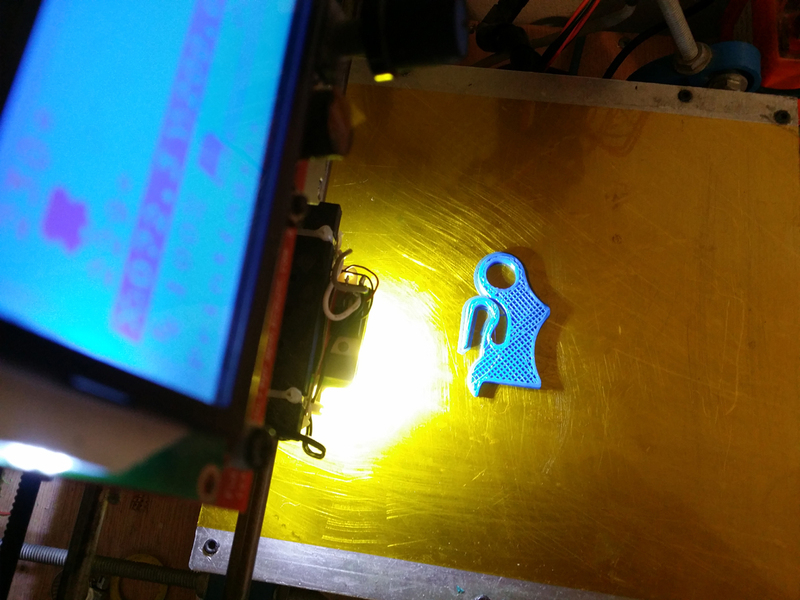 Happy 3D printing!